For the past nine months, SOURCE Photographic Review been working on a redesign of the magazine that will be published for the first time this December. To mark the redesign, SOURCE are holding a series of launches across the UK and Ireland. As well as unveiling the new magazine, they'll be staging a photography quiz pitching photographers against curators and critics. 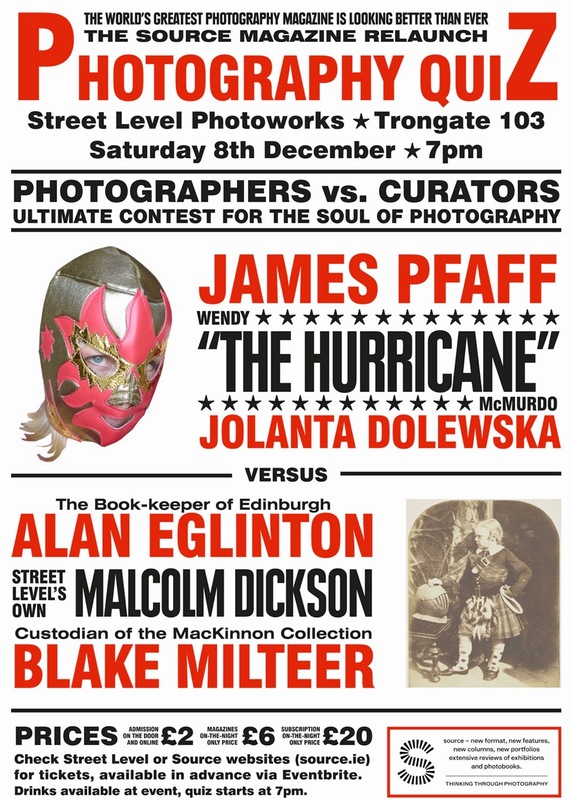 Join SOURCE at Street Level Photoworks to celebrate the launch of the new issue and watch photographers Jolanta Dolewska, James Pfaff and Wendy McMurdo go head-to-head with our curators and critics Malcolm Dickson (Street Level Photoworks), Alan Eglinton (Edinburgh Photobook Club) and Blake Milteer (The Mackinnon Collection). Tickets: £2, including a £2 discount off a copy of the new magazine (RRP £8).